For some people, the holidays are a magical time of gratitude, joyful reunions and spiritual celebrations. Then there are the people with families. Odds are slim that you get along perfectly with every relative DNA testing could force you to claim. So if you find yourself dreading the big dinner or gift exchange, prep yourself before you head into the holiday fray, said Amy Twiss, licensed professional counselor. Pay close attention to your most accurate “wackometer” – your body. 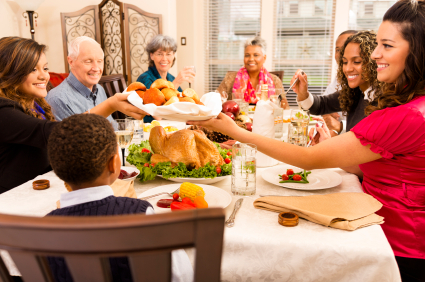 In addition to emotional cues like anxiety, dread or fear, you may have physical reactions to your thoughts about the family gathering. To avoid bad feelings – physical and emotional – consider what kind of person you’re dealing with and the best ways to manage that personality type. This is an older version of the playground classic. This overbearing person needles you, puts you down or tries to intimidate you. The best way to beat him at his own game is to refuse to play. This person has to be the center of attention. Whatever anyone else has achieved or suffered, she can one-up. She’s constantly steering the conversation back to her awesomeness, or maybe she’s a hypochondriac who gets off on the sympathy she receives from concerned family members. But the “ME, ME, ME” can get old and cut into catch-up time with people whose stories you actually want to hear. The good news: She can be retrained with positive reinforcement, much like a dog, Twiss said. These people can be frustrating, because they put on a false front then hold it against you when you take them at their word that everything’s fine. Instead of being honest, he puts the responsibility on you to dig for information and come up with a way to make him feel better. Healthy relationships don’t work that way, Twiss said. If this person refuses to discuss the problem or issue with you, tell him you’d be happy to discuss it if he changes his mind, then drop it. Regardless of whatever specific personality types you have to contend with, don’t take it personally. View the situation as if you were watching a play rather than acting a role in it, Twiss said. “Remind yourself during all the drama that it’s their drama, it’s not about you, then that will make a significant difference as well,” she said. Also, be mindful of how you’re feeling and think about your response. It all comes back to having a plan, Twiss said. Set very clear boundaries with your loved ones about what’s off limits and where you draw the line. If someone crosses that line, kindly point it out and give him a chance to make amends. And above all else, take care of yourself first and foremost. If you know you’ll feel bad no matter what, limit your time or just don’t go.